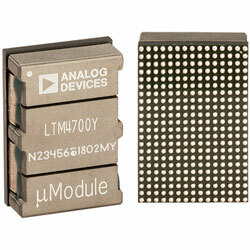 The Linear Technology / Analog Devices LTM4700 µModule Regulators are a dual 50A or single 100A power module DC-DC regulator. These devices feature remote configurability and telemetry-monitoring of power management parameters over PMBus, an open standard I2C-based digital interface protocol. The device is composed of precision mixed-signal circuitry, fast analog control loops, EEPROM, power MOSFETs, inductors and supporting components. The device’s two-wire serial interface enables outputs to be margined, tuned and ramped up and down at programmable slew rates with sequencing delay times. Input and output currents and voltages, output power, uptime, temperatures, and peak values are readable. Custom configuration of the EEPROM contents is not needed. At start-up, switching frequency, output voltages, and channel phase angle assignments can be set by pin-strapping resistors. Typical applications include system optimisation, characterisation and data mining in prototype, production and field environments; telecom, datacom, and storage systems. The device is provided in a 15mm x 22mm x 7.87mm BGA package available with SnPb or RoHS compliant terminal finish.